The stars observatory on the Roque de los Muchachos in winter. 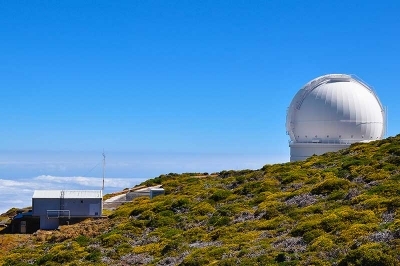 On La Palma are situated the biggest stars observatories in the northern hemisphere with in these days the biggest optical telescope to observe stars, telescopes to observe the sun and two telescopes to register the gamma radiation in the high frequency range. Installed are these telescopes at the edge of the highest mountain of the island, the Roque de los Muchachos, with a heights of 2.426 meters. Beside the very clean air on the island witout any industry a "regulation for the light smog" (Ley del Cielo) ensures a clear observing of the celestial bodies. The hight of approximately 2.500 meters allows to be above the clouds (mar de nubes), which are carried by the permanent trade wind and makes it possible to see the starry sky unclouded. 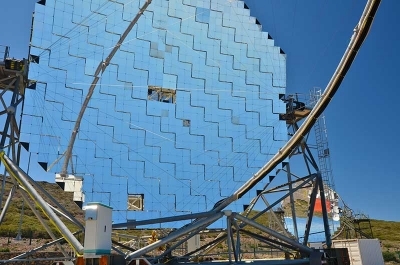 Many countrys and institutions are involved in the different telescopes on the Roque de los Muchachos and delegate scientists and workers to La Palma. Astrophysicists, students, specialists and interested persons are attracted by the IAC (Instituto de Astrofísica de Canarias) since many years. This suggests to use the characteristics of the island for touristic reasons. Therefor the government of the island provides financial support to for example allow owners of holiday houses to install an own little observatory to encourage the astrotourism. Beside the few private owners of telescopes and the rental of two smaller telescopes there were no possibilty for tourists to observe the incomperable starry sky of La Palma with an optical device. The first little observatory, which was built with subsidies of the island government will soon be standing in the holiday houses Geranios and Abuelos. Beside the extremely extensive and multilingual library there are offered smaller trips from skilled personnel in the width of the universe for interested guests. After a small introduction it will be possible that you use the telescope on your own to observe the nightsky. This brings the advantage that as soon as the sky is clear you can look into and don't have to wait for an appointment. This service will be avaiable for all my guests of the holiday houses! Of course at 600 meters above the sea level the conditions are not as good as on the Roque del los Muchachos, but in return you can't jump into a pool in december at the Roque. The best to observe are the orbital companian of the earth and the planets of our stellar system. 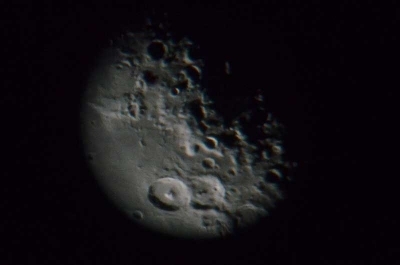 At the early increasing or descrescing moon the view on our neighbour is especially attractive as the crater with the shadows of the crater's edges appear rich in contrast. The Jupiter with it's moons and the Saturn with it's rings are good to detect in the night sky. With adapters on the telescope it is as well possible to take beautiful pictures of star clusters, stardust and planets. Through the telescope which is carrring along in direction of the turning starry sky (of course it's the rotation of the earth) the pictures are partly surprisingly very sharp and don't prone to warp like it is the case with normal telescopes. Accept this invatation and explore areas of the universe to which probably you are not able to travel to as easy as to the holiday island La Palma.